Tissue growth and maintenance begin in the womb and continue throughout your life, and nearly 2 trillion new cells are born in your body each day, according to the School of Life Sciences at Arizona State University. The nutrients you obtain from your diet support this cell growth, while nutritional deficiencies can impair tissue maintenance. You need a broad range of nutrients for healthy tissue maintenance, not just a select few vitamins and minerals, so following a well-balanced diet is the best way to maintain healthy tissue. Getting enough protein in your diet is important to maintaining healthy tissue. During digestion, your body breaks dietary protein down into small subunits, called amino acids. Your cells can then reassemble those amino acids into the thousands of proteins needed to maintain your tissues, as well as support cell growth. The average man and woman need 56 and 46 grams of protein daily, respectively, according to the U.S. Department of Agriculture. 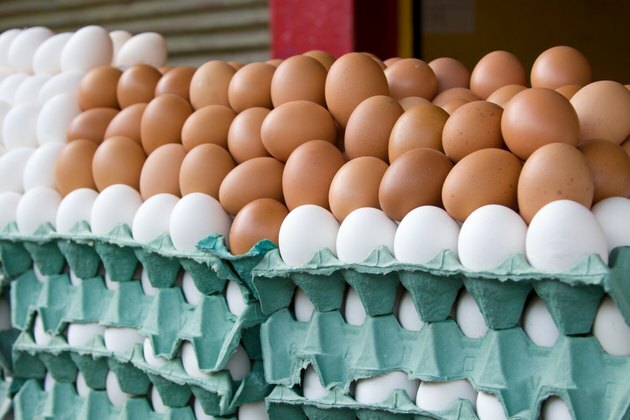 Eggs, dairy and meat serve as animal sources of protein, and the legumes, nuts, whole grains and even some vegetables in your diet contribute to your daily protein intake as well. The vitamins in your diet also contribute to tissue maintenance. Vitamin A, for example, plays a key role in cell growth by regulating gene activity -- it helps newborn cells activate genes they need to develop into functional tissue. It also plays an important role in building healthy skin tissue and promoting blood cell growth. Vitamin C contributes to tissue maintenance by helping you make collagen, a protein that supports the structure of several tissues throughout your body. The B-complex family of vitamins also supports tissue growth and maintenance by helping your body convert food into energy, ensuring that your cells have the fuel they need to generate new tissue. The minerals in your diet help you build and maintain healthy tissues. Calcium, for example, makes up an essential component of bone tissue, and failing to get enough calcium in your diet increases the rate of bone loss as you age. Phosphorus, like calcium, contributes to healthy bones, and it also helps you make DNA and cell membranes -- two components essential for tissue maintenance and cell growth(. Copper also contributes to tissue maintenance -- like vitamin C, it's involved in collagen production. The carbohydrates and fats in your diet also contribute to tissue growth and maintenance. They both provide energy that your cells need to function, offering fuel to support new cell growth. The fat in your diet also serves as a source of fatty acids, which your body can use to maintain healthy cell membranes. The USDA recommends consuming 130 grams of carbohydrates daily and advises that fat should make up between 20 and 35 percent of your daily calorie intake. In a 2,000-calorie diet, this means between 44 and 77 grams daily. Why Do Vitamin E & C Work Well Together? Is Vanilla Silk Soy Milk Good for You?